Common sense, and a little technical work, will improve the appeal of your site both to visitors and to Search Engines. If you have a Ski Site and are new to the world of Search Engine Optimization (SEO), this will help you get started in the right direction. A unique domain name is a necessity if you want the online face of your business to be taken seriously. If you don't yet own one, take some time to choose one relevant to your brand or business name. Think about the way you use a Search Engine, and the way you scan a web page when it first loads into your browser. Now think about how and why someone would be looking for a site like yours. What search term might they type into a Search Engine ? What words might they expect to see when they arrive on your site ? What words will they look for to make sure they came to the right place ? These are your Key Words and Phrases and you need to give them special attention. If someone is looking for a "Catered Ski Chalet in Chamonix", what phrase will they tap into Google? And will they be confident if the first thing they see says "Welcome to my Home Page, my name's Bill and I've got a big new Hot Tub" (sorry, Bill, we're sure your Hot Tub is lovely but tell us about it later...). You need to give your Visitors (and the Search Engines), explicit and obvious clues as to what your web site, and every page on it, is all about. Focus the Pages - stick to one subject per page. Link your Pages with Key Phrases - use meaningful phrases and names in your site's navigation. Add Interesting Content - such as a Snow Forecast from J2Ski, just like this! Link to an "Authority" Snow Sports Site - if your site is related to Skiing or Snowboarding, you should consider linking to J2Ski. These tips refer to particular HTML elements. We recommend the HTML tutorials on W3C if you are unfamiliar with HTML. What is it ? This is in the HTML code for the head of each page, and specifies the text that will be shown in the title bar at the top of a browser window when it loads the page. Why is it important ? It is indexed by the Search Engines, and may be used to annotate a reference to your site in a list of Search Engine Results. The searcher may decide whether or not to click to your site depending on what your title says. What do I need to do ? Ensure each page has a unique title tag that is an accurate title for that page and that starts with an appropriate key word or phrase. What is it ? A piece of HTML code in the head of each page, that describes - for the benefit of the search engines - what the page is about. Why is it important ? It is indexed by the Search Engines, and may be used to annotate a reference to your site in a list of Search Engine Results (instead of the title tag). What do I need to do ? Ensure each page has a unique description meta tag that is an accurate description of the contents of the page. What is it ? A piece of HTML code in the head of each page, that lists the essential keywords relevant to the page. Why is it important ? It may be used by the Search Engines to help them work out the subjects covered by your page. What do I need to do ? It is essential that you keep this list short, and tightly related to the content of the page - irrelevant or verbose keywords will be ignored or most likely, and much worse, result in your search positions being suppressed. What are these ? These are the <h1>, <h2>, <h3> and <h4> tags used to specify headings in the page. Why are they important ? They help you structure your page content in a logical manner, and may help search engines understand your page. What do I need to do ? Use the headings to catch the eye of the visitor, including prominent and relevant key words to help both visitors and search engines. This is one place your Key Words and Phrases should definitely appear. Links are the World Wide Web. To be visible and credible to your visitors and, of course, to the Search Engines your web site needs to be linked to and from other relevant sites. It is extremely important to link out to relevant Web Sites. Placing a link from your site to another relevant site helps reinforce the association of your site with the common subject (e.g. "Snow Sports" or "Skiing in France"). 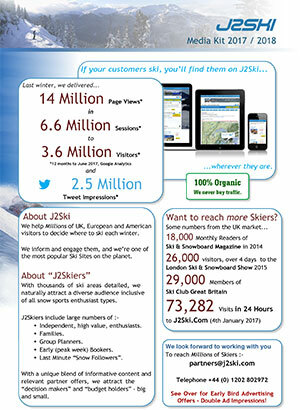 So if you think that J2Ski is relevant to your visitors (we hope so!) then feel free to Link To Us. It is important to encourage other relevant sites to place links to yours; this is very important to Search Engines as it indicates that someone else thinks that your site is worth linking to. The absolute best way to get other sites to link to yours is to offer something of relevance to their visitors. It can also be productive to e-mail the webmasters of relevant sites, suggesting that they link to you - but a good webmaster will only link to decent sites that are relevant (there's that word again) to their own. 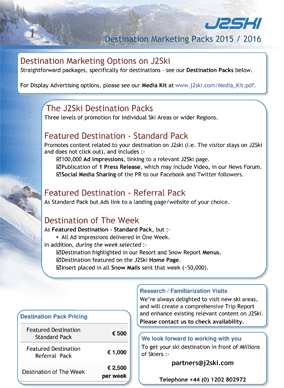 You can ask us to list your Snow Sports Web Site on J2Ski, but note that inclusion is at our sole discretion. Did we mention that yet ? Links to and from un-related sites are useless to visitors and search engines. A visitor to your ski chalet site will not be interested in your boyfriend's poodle parlour - and a search engine may get confused as to the subject of your site. The presence of interesting information, perhaps about your local ski area, can engage a visitor and encourage them to spend more time on your site. If your web site is associated with one or more ski resorts, consider adding a Snow Forecast to your home page. To add a J2Ski Snow Forecast, navigate to the appropriate ski resort in our Snow Forecasts section and scroll down. Copy the HTML code in the blue box into your own page for an automagically updated 7-day Snow Forecast. Job done! Stay clear of tricks, and run away from anyone claiming to possess a magic bullet for search optimization. Search Engines are really good at figuring out if they're being gamed; they've seen it all before and they have a range of penalties that can consign your site to oblivion at a stroke. You need a little technical know-how, some common sense and a lot of attention to detail. The techniques that work are those that make your web site easier and more enjoyable for your visitors to use. At the very least, you should now read Google's Webmaster Guidelines which have more tips and advice for creating a site that is good for your visitors and easy for the Search Engines to crawl. We recommend creating a Google Sitemap when you're comfortable, and making use of Google's extensive (and free) Webmaster Tools. Promote your Ski Business Now! With J2ski, you can present your business to thousands of Skiers and Boarders each day, with Targeted Advertising across J2Ski.Com and a Free Directory Listing.